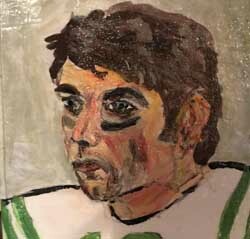 I found it delectably ironic that Dan Bern, singer-songwriter, poet, painter, columnist would send me – within days of each other – a signed copy of his new book, Encounters and then an original tile painting of Joe Willie Namath. The book, for which I could not put down once I cracked it for a mere look-see, is a series of poems about Dan’s “encounters” with the famous, talented, and inspirational, each adorned with an original Bern painting of its subject. The paintings, not unlike the one of Namath he sent me, reminded me of the few times I’d gotten within shouting distance of my childhood hero, the legendary #12 of the New York Jets, but was rendered mute and paralyzed. It is not that, like Bern, I hadn’t had dozens of encounters, both professionally and personally, with famous athletes, as well as musicians, actors, film directors, authors, politicians, etc., but Namath is different. I told Dan that my earliest childhood memories are of staring at his poster through the bars of my crib. This stuff is deep-seated with a weird mythical hold over me. This got me thinking of the insightful tone of Bern’s Encounters and how this is not a book of name-dropping and strange brushes with fame, but poignant and moving interactions – some closer and more intimate than others – that shifted the foundation of the author, so much so that in some if not all cases he would go on to put them in songs. And it is within these organic moments of admiration to worship to surprise to love to fear and ultimately inspiration that Encounters becomes the antidote to the insignificant forces of Instagram and Twitter and selfie happenstances with celebrity that now stand as something of a connection. It should be said too that Encounters represents everything that Bern has displayed through his talents over the years; it is not only poetic and visual, but musical in the way in which he writes that shoulders the conversational with a rare glimpse into the human spirit. Yet it is in the paintings that the reader can see how Dan Bern absorbs his subjects, as he had in the drawings in his first novel, Quitting Science from 2004, a book I was fortunate enough to help bring to press. Taking fictionalized versions of the familiar and the famous and turning them into extensions of his unique form is where Bern lives and breathes. And so, with Bern, over the years, in different places, we meet Willie Mays, Jimmy Carter, Bob Dylan and John McEnroe; and none of them in ways that are predictable nor inconsequential. The encounters are, as stated, extensions of his own personality and how he remembers them, at times warmly, and others quizzically, but always reverentially. His poems and the paintings are his vehicle in discovering himself through others. Bern achieves this wonderfully and without contrivance due to his self-deprecating humor on how he views these fleeting moments of significance or lack-thereof with the subjects, and what they ultimately mean to him. In some cases, as with his call into the Larry King radio show when he was just starting out as a professional musician that lasted only about a minute, and literally happened “over the air”, there is a remarkably sense of meaning. A passing comment about a dog with Leonard Cohen or a New Year’s Eve party at Bruce Springsteen’s house, an impromptu songwriting détente with Hunter S. Thompson in the back of a car or a scathing notice by Bob Dylan opens a window into the looming figures beyond the caricature. I was particularly intrigued by Bern’s poem about our mutual friend, singer-songwriter and entrepreneur, Ani DiFranco. It was my connection to Ani, after years of interviews and off-the-record discussions, that I came to know Dan’s music, and of her work with him producing his second album, Fifty Eggs in 1998. The brutal honesty of their collaboration and its results is one of my favorite pieces in the book, because of the intimate, humorous, and in many ways surprising revelations. Turning our celebrity culture on its head, as his songs have done for over two decades, Encounters is Dan Bern’s literary and artistic triumph and a true gift to the craft of storytelling.